Fig. 1. Human mtDNA replication. A. Cartoon of the key components of the mitochondrial replisome. B. Live cell confocal fluorescence microscopy of HEK-293 cells harboring GFP-p55. the mtDNA replication machinery or replisome (Fig. 1 A). Key components of this machinery include: 1) the topoisomerase that unwinds DNA ahead of pol g by enzymatically breaking and rejoining it allowing the DNA strands to pass through one another, 2) the Twinkle helicase that disrupts the bonds that hold the two DNA strand together thereby separating them, and 3) the mitochondrial single stranded DNA binding protein (mtSSB) that stabilizes mtDNA during replication. Nearly 300 pathogenic mutations in POLG cause a wide spectrum of disease including progressive external ophthalmoplegia (PEO), parkinsonism, premature menopause, Alpers syndrome, mitochondrial neurogastrointestinal encephalomyopathy (MNGIE) or sensory ataxic neuropathy, dysarthria, and ophthalmoparesis (SANDO). 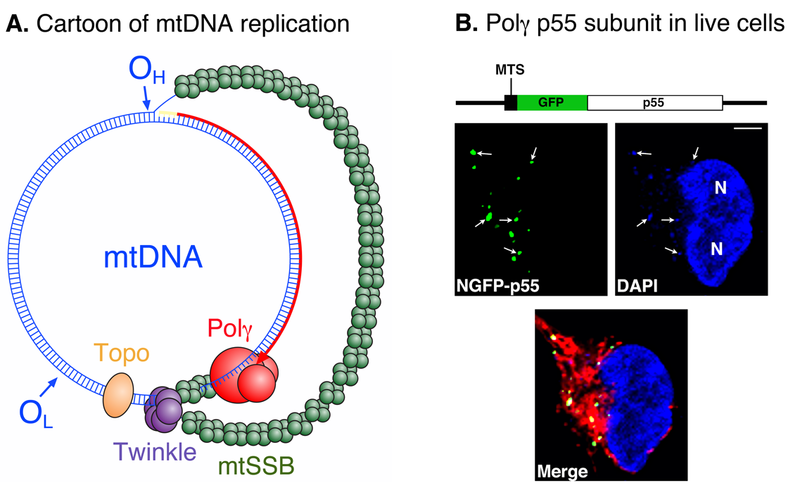 Similar to POLG, disease mutations have also been identified in the POLG2 and Twinkle genes underscoring their importance in human mtDNA replication. Utilizing live cell confocal fluorescence microscopy we demonstrated that the p55 polγ processivity subunit can be tagged with green fluorescent protein (GFP) and retains the ability to localize to mtDNA molecules within the cell (visualized as sharp green points or dots in the cytoplasm that colocalize with DAPI-stained mtDNA blue dots, Fig. 1 B). Also, we demonstrated that the native mitochondrial targeting sequence (MTS) is required for directing p55 to the mitochondrion and if it is removed p55 remains trapped in the cytoplasm following cytoplasmic translation (Fig. 2 A, d – f). Furthermore, although P205R and L475DfsX2 p55 disease variants retain the ability to localize to mitochondria, they misfold and are unable to localize to mtDNA (Fig. 2 A). Because all currently identified POLG2 patients harbor heterozygous mutations and because monomers within the p55 dimer do not readily dissociate, we theorize that patients harbor a mixture of p55 molecules: 25% wild-type homodimers, 25% variant homodimers, and 50% heterodimers. Using a tandem affinity strategy and biochemistry to study p55 heterodimers we showed that one p55 disease variant, G451E, is dominant negative and associates with a wild-type p55 monomer in polγ to poison the enzyme’s activity (Fig. 2 B). To help explain this effect we determined that the G451E p55 heterodimer has a weakened ability to bind to p140 which prevents polγ from incorporating the normal amount of DNA building blocks (nucleotides) into newly synthesized DNA. Lastly, cell lines harboring individual POLG2 disease mutations have reduced energy supplies (Fig. 2 C). We hypothesize that the various defects associated with p55 disease variants ultimately result in diminished cellular energy reserves and by extension mitochondrial disease. This study aids in our understanding of how these complex disorders develop and provides valuable cell line models of mitochondrial disease. POLG2 disease variants: analyses reveal a dominant negative heterodimer, altered mitochondrial localization and impaired respiratory capacity. Mitochondrial diseases Seemed to be of a quite serious situation. Do hope great step can be made in the research of it. Anyway, its risk is too high.